There is a considerable amount of discontent among a number of shareholders in Irish low-cost carrier Ryanair ahead of next Thursday’s annual shareholders’ meeting. In particular, there is concern over how the company is being run, with Royal London Asset Management, RLAM, The Local Authority Pension Fund, plus shareholder advisory firms Glass Lewis and ISS recommending a vote against the current chairman, David Bonderman, at the AGM. “We are also concerned with Ryanair’s corporate governance and poor stakeholder management, which could have an impact on the long-term future of the company,” Ashley Hamilton Claxton, head of responsible investment at RLAM, has commented. With Ryanair having suffered its worst spate of strikes this past summer and only an agreement reached with Irish pilots, cabin crew in Spain, The Netherlands, Italy and Portugal are still planning a one-day strike on the September 28 and one day every month thereafter until their demands have been met. The British Airline Pilots Association (BALPA) has made it clear that the relationship between Ryanair management and pilots has become “utterly dysfunctional”, which is putting the future success of the company at risk. BALPA is urging shareholders to replace both O’Leary and Bonderman. Rotable Repairs, one of UK’s leading providers of Wheel and Brake MRO services looks to expand its capacity and offering within the UK due to continued growth and customer requirement. The Aircraft Wheel & Brake Specialist will soon be relocating both the office and workshop environment under one roof within a new and improved 49,000 ft² wheel and brake facility which is scheduled for completion by Winter 2018. The facility, based on Progress Road, Southend-on-Sea has been meticulously planned by utilising the accumulation of experience provided by new and existing staff to ensure a complete and efficient workshop experience which compliments growth, provides increasing customer benefits and additional support for the OEM’s it represents as a service centre. With the additional 45,000 ft² of aircraft tyres held by our sister company Watts Aviation, Rotable Repairs can offer immediate off the shelf solutions for all of its customers. Rotable Repairs became part of Desser Holdings toward the end of 2017 and has been working with the group to improve its offering to the industry. The development of this facility is part of its ongoing strategy to increase its portfolio of aircraft wheel, brake, tyres and associated products. Headquartered in Los Angeles, Desser Holdings is the parent company specialising in aircraft tyres, wheels and brakes, the group is represented in the US, UK and Australia. Global aftermarket solutions company AAR will provide full power-by-the-hour (PBH) support of Air New Zealand’s A320 fleet under a long-term agreement. The contract covers a total of 48 aircraft including 30 A320ceos and 18 A320neos. Virgo Investment Group is expanding its aviation business via Zephyrus Aviation Capital. Several former CIT Aerospace executives have partnered with Virgo to transform Zephyrus into a full-service platform and the Company is completing a large portfolio acquisition. Zephyrus is a fleet management solutions provider to lessors and commercial airlines around the world. The Company is focused on older and end-of-life aircraft and engine leasing & trading. Zephyrus is backed by funds managed by Virgo, who has been investing in aviation since 2010. With offices in Dublin and Fort Lauderdale, Zephyrus has assembled a team of seasoned industry veterans. Tony Diaz, former President of CIT Aerospace, and Damon D’Agostino, former Chief Commercial Officer of CIT Aerospace, who previously worked together for over twenty years, have joined the Company as Chairman and President & CEO, respectively. Along with two other former CIT colleagues, the team will lead the next phase of development and growth of the Zephyrus enterprise. The Zephyrus team has significant experience having previously completed over 850 aircraft sales, leases and deliveries with over 150 distinct customers in 49 countries over the past decade alone. Flightdocs, a leading provider of cloud-based aircraft maintenance tracking, compliance, and inventory management services, has named Greg Heine as President of the company. Heine, who previously served as Chief Operating Officer, will oversee the company’s technology, operations, marketing, sales, and finance and accounting functions. MRO service provider SR Technics, has signed an agreement with a new customer, Skymark Airlines, to provide engine MRO services for the Japanese carrier’s CFM56-7B engines. Under the five-year agreement, SR Technics will handle Skymark’s engine shop visits at its Zurich and Cork facilities. The new agreement was signed after a period in which SR Technics performed several one-off engine shop visits for the Japanese airline. Skymark is continuously expanding its fleet and services and has therefore decided to partner with an MRO provider known for its flexibility, unbeatable turnaround times and quality standard – further strengthening SR Technics position in the Japanese market. 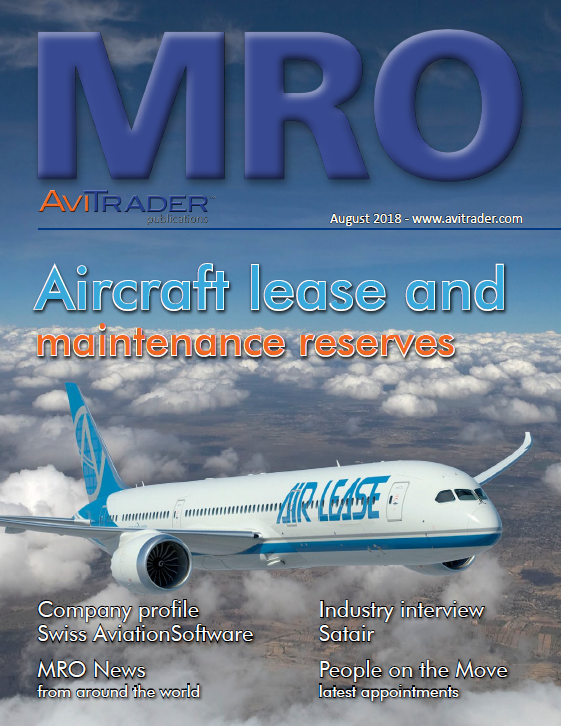 AerSale®, a global supplier of mid-life aircraft, engines, used serviceable material and MRO services, has opened a new business unit in Roswell, New Mexico, to be named AerSale Parts Manufacturing. An official ribbon-cutting ceremony is scheduled for September 25, 2018. Roswell Mayor Dennis Kintigh, AerSale Parts Manufacturing General Manager Randy Phelps, and the Roswell Chamber of Commerce Redcoats will be in attendance. AerSale Parts Manufacturing has received Parts Manufacturing Approval (PMA) from the Federal Aviation Administration (FAA) to produce commercial and military aircraft parts and spares (FAA PMA PQ03874SW). 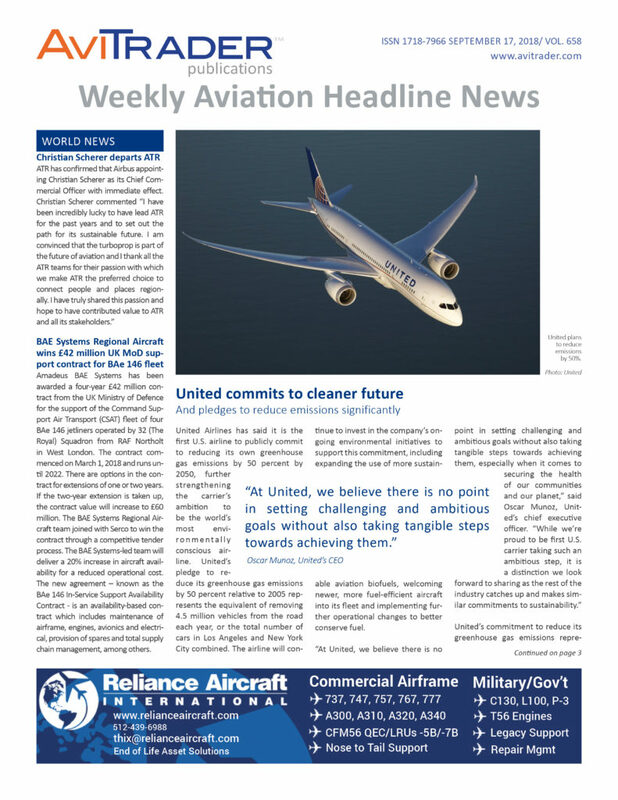 The business unit will also be responsible for developing proprietary systems such as AerSafeTM and AerTrakTM, which have been issued Supplemental Type Certificates (STCs) from the FAA to comply with the agency’s various rules and mandates. AerSale Parts Manufacturing is a full-service design/build/install aircraft modification and alteration facility, from initial concept to certification. Its extensive capabilities include engineering and design, metal fabrication, wire harness fabrication, marking and ID capabilities, system kitting, and end-product supply logistics management. Salesforce, a global leader in CRM, has announced that Cathay Pacific is using Salesforce to accelerate digital transformation, generate new revenue streams and improve customer experiences with personalized engagements. An existing Salesforce Sales Cloud and Service Cloud customer since 2014, Cathay Pacific is deploying Salesforce Marketing Cloud to unify sales, service and marketing, and deliver connected, personalised customer experiences across any channel, including email, social, digital advertising and more. With the addition of Marketing Cloud, Cathay Pacific will focus on three key areas: acquiring new customers, personalising all touch-points along the traveller’s journey and getting a complete 360-degree view of the members of its Marco Polo loyalty programme. Cathay Pacific’s digital transformation is led by a vision that recognises and caters to the evolving needs of its customers in order to increase its competitiveness in the airline industry. GA Telesis has appointed Mauro Francazi as Director of Business Development - Europe. Mauro brings nearly 30 years of aviation experience in leasing, finance, procurement and fleet management. Mr. Francazi joins GA Telesis from Alitalia, where he served since 1989 in many roles including Director of Irish entities of the Alitalia Group. His most recent position was Head of Fleet and Technical Procurement where his responsibilities included managing a fleet of 118 aircraft. Joining the GA Telesis Asset Transaction Group, Mauro will be responsible for transaction origination, developing new and maintaining existing relationships with airlines, financial institutions, leasing companies, OEM’s and MRO’s in Europe and adjacent regions.